A wide expanse of white surrounded us. Off into the distance we were surrounded by towering peaks, white gully’s, and crevasses so deep that they fade into black. As the helicopter landed, it’s skids plunging into the icy layer, we felt so disconnected from civilization. We were standing on an active Alaskan glacier, millions upon millions of years old, it’s existence forming and irreplaceable bond between the landscape and the people who live in this wilderness. Our trip to this glacier was not only an incredible experience, it was also an environmental lesson and a unique opportunity to see what this landscape truly signifies. 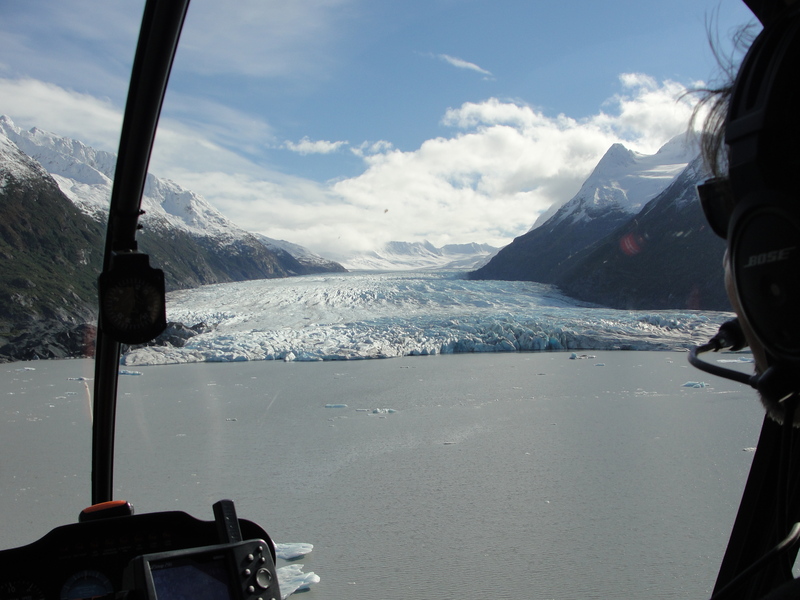 Our helicopter tour of this glacier allowed us to see first hand the beauty of this unique wilderness, and why it must be protected. My friend Nicole and I set off for our adventure that morning, driving down the Seward Highway towards the tiny resort town of Girdwood. The drive was nothing less than spectacular. 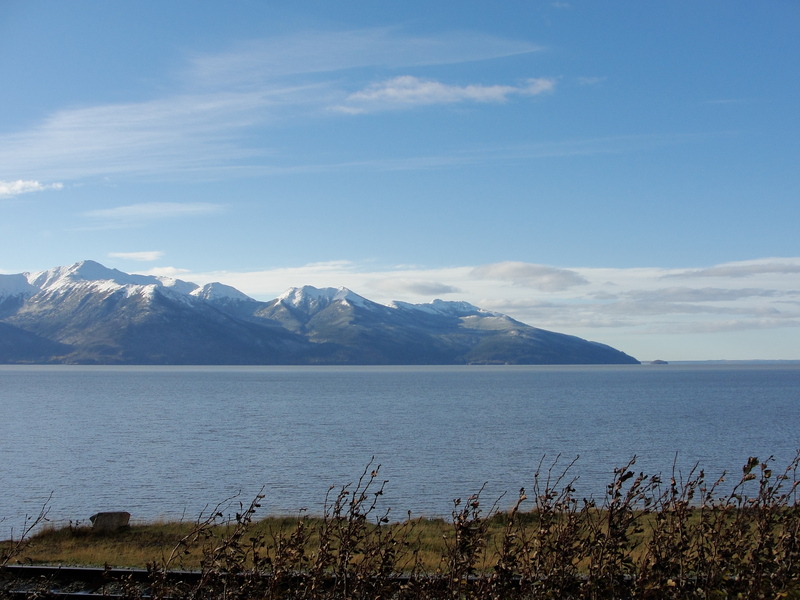 Flanked by the Turnagain Arm, branching out from the Cook Inlet, we were greeted with a clear cloudless day and surrounded by enormous snowcapped peaks that pierced the blue sky of this beautiful morning. Our drive took us through pristine pine forests, hemlock bushes, and untouched wilderness for miles as we followed the single southern roadway. Our drive from Anchorage to Girdwood took over an hour and the resistance to stop every five minutes to take pictures of the landscape was overbearing. We arrived in the small ski resort town in the late morning. Our flight wasn’t for another two hours so we settled for breakfast in the tiny Jack Sprat restaurant. The restaurant was the quintessential ski resort chic. Beautiful wood trim and natural accents made it cozy, intimate, and inviting. Our waitress sat us in a glass “greenhouse” room, where windows looked out into the roof and our view was mountains and pine forests. 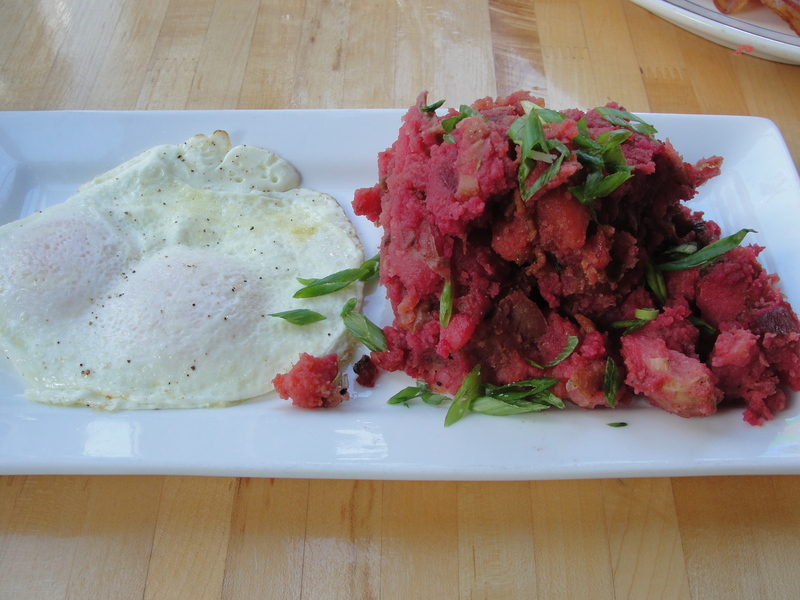 Nicole and I both settled for the Red Flannel Hash, sweet mash red potatoes and bacon with a single fried egg. To say that our breakfast was spectacular is an understatement. This day was already on the right foot. Filled up on eggs and cappuccino’s we made our way to the airfield, past small wooden vacation homes that lined this small community. The single runway airfield was the base for Alpine Air a small airline that provided everything from glacier tours, to scientific flights, dogsledding, and bush pilot services that help the small Alaskan communities where the road is impassable. As we waited for the helicopter to return from its first flight, we watched these small single engine planes land and take off. Much of Alaska is without roads. Communities past the town of Fairbanks are without roads, and rely on bush pilots to keep them regularly stocked with supplies or connect them to bigger towns if the need for aid comes up. Many even commute by plane to get to work and then return the same day. As we were making ourselves comfortable, we heard the familiar chip of the helicopter and watched it fly over the peak just behind the airfield. The pilot expertly flew the length of the airstrip before coming to a rest just in front of us. After shutting down and quickly refueling, our pilot, extremely enthusiastic and clearly loving his job, introduced himself and got us settled inside of the tiny helicopter. There was a bit of anxiety before we took off. We were in a helicopter. In Alaska. The enormity of this moment (or of the landscape) hadn’t quite hit us yet. Excitement was slowly building. After a quick power up, the engines came to life. We were wearing headsets so that we could hear and talk over the buzzing engines. As soon as the engines were up to speed, our pilot opened the throttle and smoothly took off going low just above the airfield. Our altitude grazed pristine forests just outside of the airfield and like a curtain pulling off to the side, the splendor of this incredible land revealed itself. Forests gave way to plains and muddy inlets. Water gave way to rocky grasslands, and just where the tree line ended, we saw ice. Pure glacial ice rising far into the distance. Our guide explained to us how this landscape had changed since the devastating 1964 earthquake. The land had risen and the town of Girdwood itself had to be rebuilt. Water flowed where it hadn’t before and the entire ecosystem was affected. Our helicopter buzzed just above the cliff face, and we were on the lookout for wildlife. We really wanted to see bears, but unfortunately they had moved into higher altitudes to prepare for their hibernation. 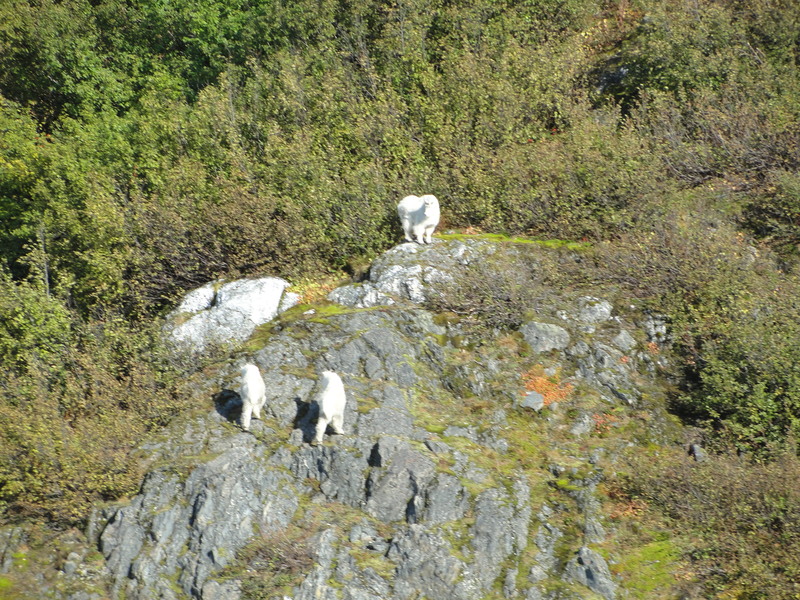 However at one point our pilot pointed the nose towards one of the faces and we were delighted to see several wild mountain goats, famous for their long curved horns, happily grazing on a precipitous cliff. We made sure to keep our distance not to bother them, and our pilot turned the helicopter and headed farther up the valley. As suddenly as it appeared, the green grasslands gave way to a narrow waterway. Mud disappeared and we made out the unmistakable white capped icebergs floating in dark hued water. As our helicopter veered left, the face of the glacier suddenly appeared, and it was absolutely massive. The ice pulled high above the water, cracked by holes, crevasses, and cornices so thin, it was a wonder how they were still standing. As we flew over the surface, we could make out glacial pools of water so spectacularly blue it put even tropical waters to shame. Cracks and crevasses disappeared into pure blackness, and we could see the folds where the glacial pushed forward, scrunching up like a crushed piece of paper. There was no mistaking, this glacier was living. It is constantly pushing forward, cracking, deforming, changing, new sheets of snow affecting its every change. Our helicopter buzzed over the side and we could see where the glacier was slowly falling away next to a rocky face. We could see the melt slowly running off and find where the face was dramatically cracking away. 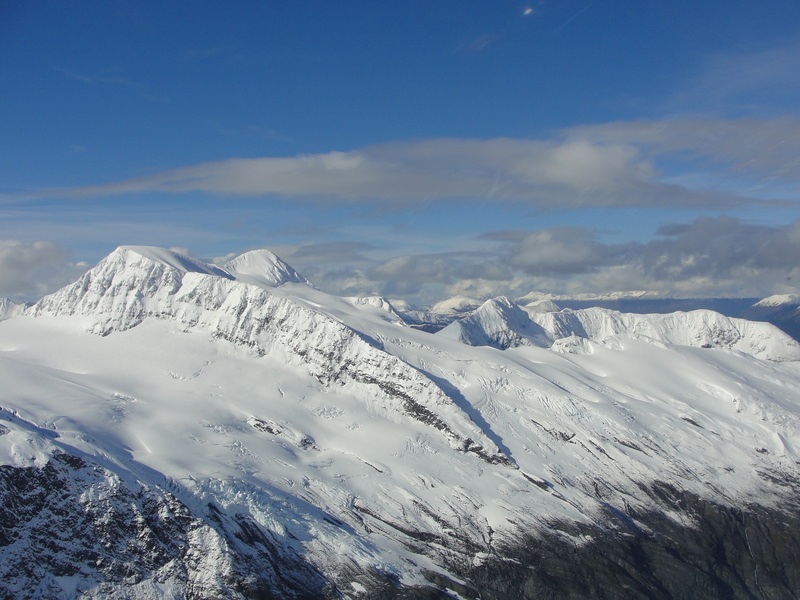 Our pilot remarked that while most glaciers had been falling back, this one had actually experienced record snowfall in the last year, and as he remarked: “It’s a great year to be a glacier.” Alaska depends on this glacial water. It fuels the sound, the inlets, the waterways, and even things as small as drinking water are all dependent from this landscape. We were looking first hand at the environmental effects on the ice, and although this glacier was doing quite well, it was a bit disheartening to understand how most of them are massively receding. The cracks ended and we found ourselves flying over a featureless white snowfield. Our pilot picked a prime spot in the valley between two massive ranges and slowly pushed the helicopter downwards, bringing the skids slowly in compact ice. The surface was deceptively firm as the skids sank into the snow. Our pilot powered down the engines and opened our door as we eagerly stepped onto the white field. The feeling of nothingness was overwhelming. 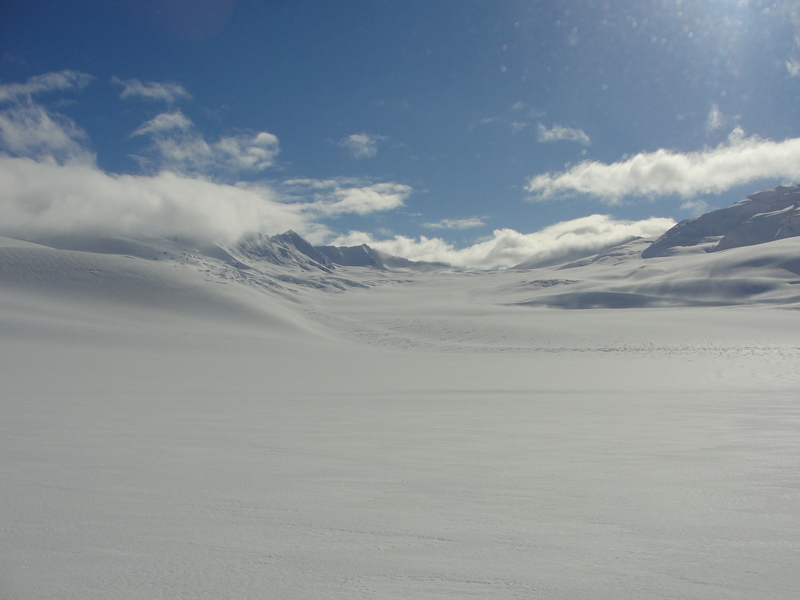 The entire field felt larger than life and Nicole and I walked out onto this landscape, formed by millions of years of geology, and our boots sank deep into the thin sheet of ice that covered deep powdery snow. Our pilot, now going into professor mode, explained to us how each sheet of ice is laid down, and pushes older ice forward, advancing the glacier and pressing against those folds that we saw before. 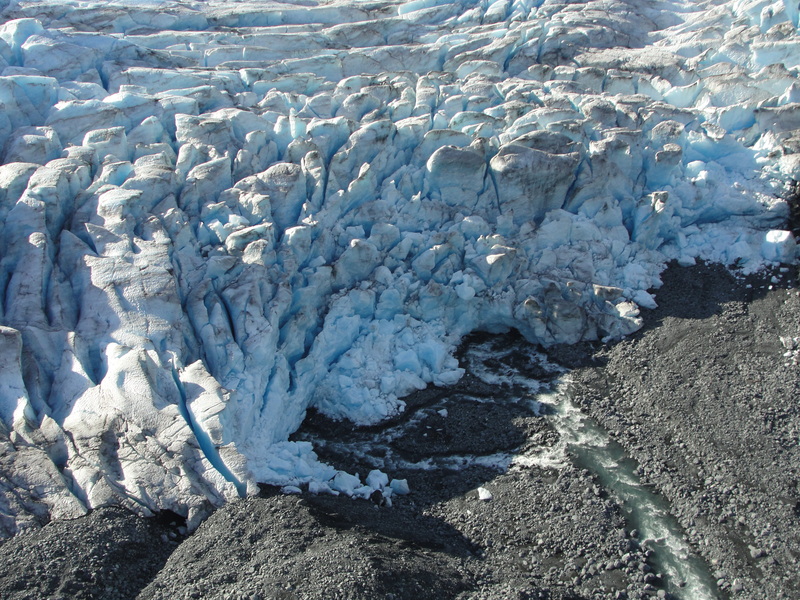 The glacier is likened to a frozen downward river, with the icefall at the front the point where the glacier runs into the bay and fuels the waterways. We spent nearly twenty minutes walking around and taking in the view before our pilot told us he wanted to take the long way back to the airfield. I thought this had been the high point of our adventure as I filed back into the helicopter, switching spaces with Nicole, and now I was sitting at the front, looking out through the large bubble windows. 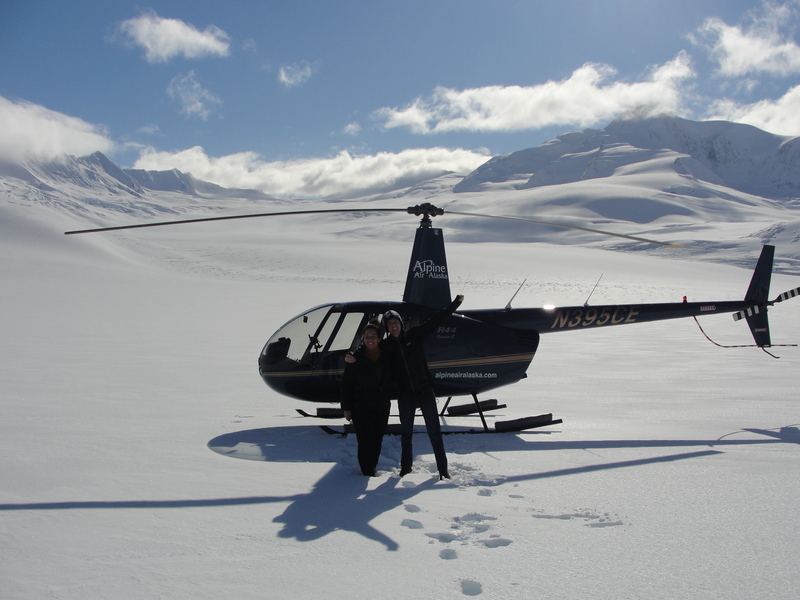 I was pleasantly proven wrong as the helicopter lifted off the glacier, and suddenly the field dropped off, and we found ourselves now buzzing between the towering mountains, deep frozen valleys, and glaciers even hanging off the side. These rivers had now gone vertical, like waterfalls frozen in time coming down from the summit. My climber inclined mind was searching for routes and imagining what an awesome view it would be from the top. Our helicopter danced between one peak and another as the ice slowly transformed into rock, and rock transformed slowly into green as we flew back towards the gully. As we came back towards the airfield, an unmistakable bald eagle, in it’s brilliant brown and white color escorted us back towards the forest. 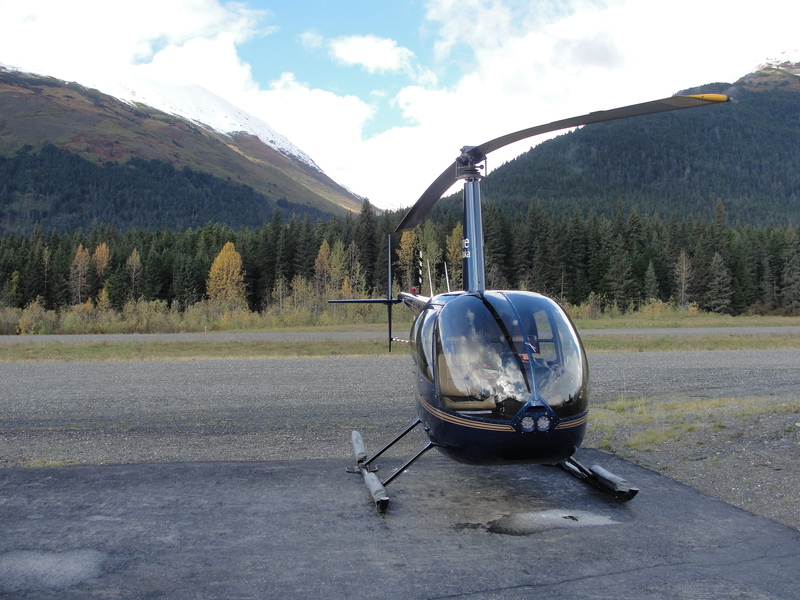 Our helicopter flew just above the roadway, the only sign of civilization for miles being small wooden buildings before coming in low above the treetops, and then after coming above the airfield, turned and gently touched down in the spot where we had started. Our eyes still twinkling and the memory of this incredible still fresh, we waited for the engines to shut down, and thanked our pilot before stepping out and heading for new adventures. It is impossible to comprehend the full enormity of these glaciers. Our flight over this incredible river of pure ice was not only an unforgettable experience, but a lesson in their integral part of the ecology and geology of this place. It helped understand how something as simple as new snow, or a new thin sheet of ice pushes it forward and influences every change in the valley. The glacial flight was beyond unbelievable. It gave us a brand new view into the land, and it was an inspiring and unforgettable lesson. I always look forward to your blogs, but this one was particularly impressive. You captured the grandeur of the landscape and the powerful feelings it evoked in you, pulling me into your adventure completely. 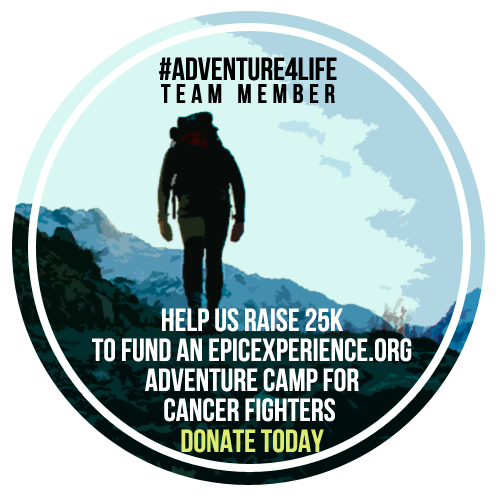 Keep up the amazing work!